Escobar isn’t a big guy, but his fastball was sitting at 92-94 in training camp in 2015. He’s added velocity since then, usually sitting around 94 and reaching 97. He also throws a curve and change, both of which are swing-and-miss pitches. The Pirates’ Latin American scouting has improved drastically since the dark days of Dave Littlefield, but their strength in the region has been position players rather than pitchers. Escobar is one of the more interesting pitching prospects they’ve brought to the US from the DSL recently. Escobar pitched out out of the rotation in the DSL and had trouble throwing strikes. He made a lot of progress after the early season, though; sixteen of the 29 earned runs he allowed came in the first three of his thirteen starts. His season was cut a little short by an appendectomy. Escobar made eleven starts in the GCL and tended to be very good or extremely bad. His first three starts were a good example: In the first one he failed to get out of the 1st inning, then he followed that up with two consecutive starts in which he threw five scoreless, one-hit innings. Three starts later he again failed to survive the 1st. Overall, though, he pitched well, with solid walk and K rates, and an opponents’ average of just .200. The Pirates moved him up to Morgantown at the end of the year, an indication they consider him a real prospect. He pitched fairly well in one start and then struggled in a second. He was considerably younger than the NYPL average age. Escobar pitched mainly out of the rotation for Morgantown. He continued to be erratic with his command, sometimes running up high pitch counts and walking hitters. He improved after the early season, though; he walked 12 in his first 12.2 IP and only 16 in his last 55. Escobar lasted six innings in five of his last eight starts after taking until his fifth start to last five innings. He was effective against left- and right-handed hitters, allowing them OPS totals of .585 and .643, respectively. Escobar had an uneven season in the West Virginia rotation. He dominated at times and led the South Atlantic League in strikeouts, but he also had control problems, running into issues with walks and high pitch counts. He got off to a fabulous start, fanning 41 batters in his first 22.1 IP, but at some point the hitters apparently realized they shouldn’t chase Escobar’s breaking stuff out of the strike zone. He was up and down throughout the year, with his worst month (June — 6.48 ERA) followed by his best (July — 1.32). On the season, opponents batted just .200 against him. 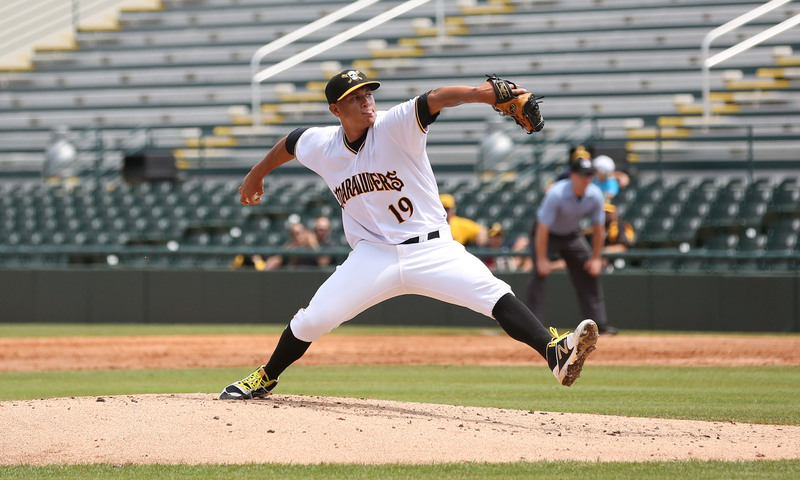 The Pirates added Escobar to the roster in the fall to protect him from the Rule 5 draft. He spent the first three and a half months of the season at Bradenton, where he was very erratic. He had a number of very strong games, but also quite a few poor ones. The problem usually had something to do with control, either walks or high pitch counts. His K rate was down sharply, as hitters stopped chasing so many breaking balls off the plate. In mid-July, the Pirates promoted Escobar to Altoona, probably less due to merit than due to the pressures created by him only having two options after 2018. He struggled in AA, as the walk and K rates show. He failed to go five innings in three of his seven starts. To make things worse, Escobar and Yeudy Garcia were suspended near the end of the season due to an unspecified violation of team rules. The Pirates will move Escobar to the bullpen in 2019. Not only that, they’ll send him back to Bradenton to open the season. Considering that he’ll have only one option left going into 2020, that’s not good. July 8, 2013: Signed by the Pittsburgh Pirates as an international free agent. November 20, 2017: Contract purchased by the Pittsburgh Pirates.